Sri Lanka has received the full membership of one of the leading experiments at CERN, Switzerland, creating opportunities for young scientists to conduct research in the area of High Energy Physics. The selected candidates shall be registered at University of Ruhuna or University of Colombo for PhD degrees. They will be mainly based in Switzerland to conduct their research. Application: Self prepared application with a CV, qualifications, experience, special achievements and awards and a statement of interest shall be sent to the following address to be received on or before January 14th 2018. Address: Secretary, Ministry of Science, Technology and Research, 3rd Floor, Sethsiripaya, Phase 1, Battaramulla. Qualifications: B.Sc. 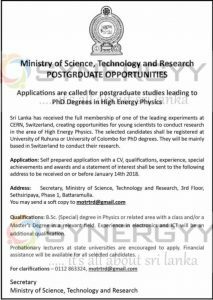 (Special) degree in Physics or related area with a class and/or a Master’s Degree in a relevant field. Experience in electronics and ICT will be an additional qualification. Probationary lecturers at state universities are encouraged to apply. Financial assistance will be available for all selected candidates.